Various conditions can make your hair to start falling out in the shower. Hair loss is a common problem in both men and women. If you like washing and brushing your hair regularly, you may notice that strands or even chunks of it are in the shower drain. The loss of hair from your scalp could be due to the activities in the shower. There are other reasons that could lead to thinning and falling off. These range from the equipment you use, the chemicals and the way you handle your hair. The brushes, shampoos and the water in the shower goes a long way to affect your hair. According to Francesca Fusco, MD, a New York City Dermatologist, a specialist in hair loss, T The loss of about 50 to 100 hairs in a day is normal. Hair loss could mean a mild or a more serious condition. However, if you lose more than the 100 hairs in a day, it is rendered abnormal. Your hair falling out when you are brushing it in the shower can be normal. However, if you realize that you have big chunks falling off, then this should prompt you to seek attention from your medical professional. The overactive and underactive thyroid gland are all suspected to cause hair to begin falling out. This is because the thyroid affects hormones that influence the growth of hair on your scalp. The overactive thyroid gland leads to the increased production of the hormone dihydrotestosterone (DHT) that is kill follicles. Your hair will soon start to thin out gradually. An underactive thyroid gland reduces metabolism in the body. Apart from that, the levels of acid in your body drop and your gut is not able to absorb the important minerals, proteins and vitamins that are all essential for the development of hair. Hot showers have the potential to damage your hair follicles, especially if the temperature is beyond 37 degrees Celsius. First of all, the water has the ability to damage the scalp and thus causing dryness. In the long run, this could cause inflammation and in the long run thinning of hair and then loss. Besides, the hot showers remove essential oils that are useful in protecting your scalp. This leaves your scalp more prone to damages that may come by. The follicles will lack nourishment that is necessary to produce new hair cells. The hair will thus thin and start falling out every other time you visit the shower. According to Dr. Piliang, Dermatologist, the scalp has a fatty layer of lipids for protection. The layer keeps germs out and water inside the scalp and this makes the skin to remain moisturized. First of all, when you get stressed, it is likely that you will not give your hair enough attention in the shower. You are also likely to roughly handle your hair in the shower. This will make your hair to begin falling out in large numbers. Stress is also likely to trigger the release of hormones such as androgens that do not encourage the growth of hair. Further, stress is the beginning of scalp problems such as dandruffs that precipitate the fall of hair. Your feeding habits are likely to change when you are stressed. For hair to be healthy, you need to eat diet with a balance in proteins and vitamins, iron among other minerals. This is unlikely to happen in the event that you are stressed. You should therefore be able to adopt the necessary mechanism that will help you do away with stress. As you age, your hair also ages. You are likely to realize massive loss of hair as you approach menopause. This is because the hair follicles age and begin falling off. Apart from that, the way your system absorbs the minerals and food is likely to reduce when you age. This therefore means that your hair follicles cannot get the required nourishment and in the long run die off and hair begins to fall off in chunks. It is therefore important to be gentle to your hair when you age, try taking supplements to replenish the dietary requirement. Hormones play a crucial role in the growth cycle of your hair. Female hormones called the estrogens are friendly to the hair while the male hormones called androgens are not friendly to the hair because they can shorten the growth cycle of hair. 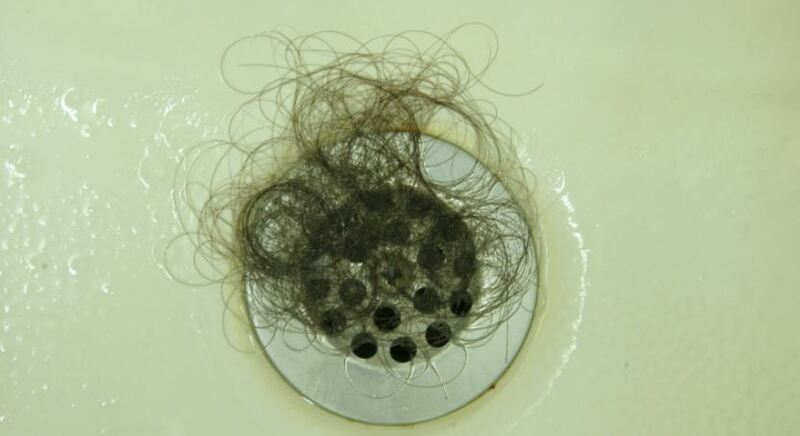 An excess of the male hormones leads to loss of hair which may start to be evident in the shower drain. There are some cases where individuals have a family history of hair falling off from their scalp. In this case you will witness slow reduction of the volume of your hair. Besides, some of your hair follicles may be very sensitive to the male hormones and this makes the follicles to reduce in size, become finer and shorter and thus begin falling. The use of hair products in the shower and other equipment that you use in the shower could impact on your hair. The water, soap and the other shower products that you use could have an effect on the growth of your hair. Your hair is likely to have an allergic reaction to some of products that make your hair to start falling off. You should avoid the shampoos that contain sulfate as they may cause your hair to fall off. Brushing your hair is some kind of trauma that can affect your hair. When combing, you should be careful to reduce the breakages that are likely to take place. Combing and brushing disrupt your hair follicles and this in turn affect its growth. When brushing your hair, you should consult with your hairdresser to get the right combing techniques to avoid any unnecessary strain. According to dermatologists, brushing bristles can create a lot of friction. It is recommended that you use a comb with a plastic and wide spread needle. Apart from that, reduce the number of times that you brush your hair. When in the shower, use the shampoo that is free from any sulfates. This will prevent the scalp from getting the irritation. The irritation is known to cause swelling and inflammation which are likely to prevent the normal growth of hair. Obtain a moisturizing conditioner. This should be derived from natural ingredients. The conditioner prevents the hair from drying up and hence falling. After taking a shower, avoid covering your hair with a towel. Covering your hair brings about friction and hence causes friction. When wet, your hair is very delicate and thus applying a force and stress makes the strands to begin breaking. So, it is good for you to only brush your hair when your hair is dry and when you are out of the shower. It is not advisable for you to brush your hair from root to tip but in small sections. Begin half way at the tip and then up and down. By so doing, you will not be exerting too much pressure to your hair to make it delicate. The reasons for this are purely for hygienic purposes. There is a build up of chemicals when you use the same brush over and over again and this will affect your hair follicles greatly. You should use it first before you treat your hair. It helps to make the brush to glide easily and consequently allowing your strands to separate easily and thus giving you a desirable outcome. Brushing your hair more regularly makes your hair very brittle and damaged and thus hair loss. Give your hair some time to breathe and relax once in a while. This gives it ample time to grow to full length.